Tickle My Phone App Review, Features and Using: Remote controlling your android smartphone is made easy with Tickle My Phone App. This app allows you to control your Android smartphone or device with simple SMS commands(Messages). There may be sometimes you may be a victim of loosing or theft of your smartphone, In such cases Tickle My Phone App comes into handy. Here I will brief whole the information about Tickle My Phone App, Its Features, Its Reviews, Downloading of App, Installing and Using this App, How to use Tickle my phone. Tickle my Phone is a revolutionary next-generation application for Android phones which allows you to simply control your Android phone remotely via text messages (SMS). Have you ever think that it was possible to take a picture or record a video on your android phone, send SMS, make a call and listen to conversations, fetch exact Geo location, Get SD Card file listing from a remote location ??? If yes, this application is just right for you. How to Tickle My Phone Works ?? Tickle My Phone works as an SMS server inside your Android phone. Once you install this application in your mobile, you can send an SMS from any ordinary mobile with a specific set of Keywords in the SMS Body, App will execute the associated Action. For example, send SMS with the text “call me back” from any ordinary mobile to the Tickle My Phone installed android phone. It will call you back. Tickle My Phone Sends SMS Text Messages, Uses the Internet, Sends Email, Makes Phone calls which will cost the user. This app can be used as a Security camera at my home. This app will take the 20 seconds Live video and send as an attachment. Can be used as a reminder for wake up or for events with vibrate command. By using tickle my phone app you can send acknowledgment or thank you messages for people who ever wishing you. Android Smartphone is used in identifying the theft at your home. Place the Smartphone at an angle such that it can take photos. Whenever a suspect is there simply give a command to the app it will take live Photo or image at a current time and send to email as an attachment. You can manage sender lists on the app i.e. who can manage this app by commands such that no unknown persons will get access. Even If you lose your mobile, don’t worry, SIM change alert helps you to get back your phone from the Thief and you can control the phone also. Ability to use Calendar for events. RECORDAUDIO: Record Live Audio for 30 seconds and save the file in SD Card. 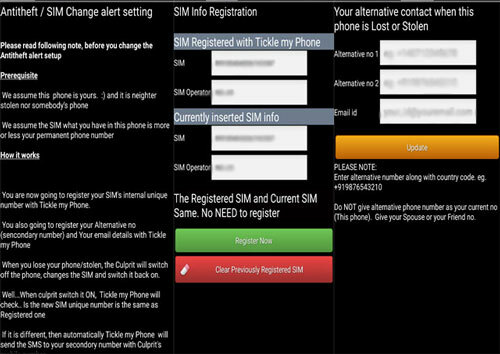 SIM Change Alert feature helps you to get back your phone from the Thief. When you lost your mobile dont worry you can track it , The person will definitely change the SIM to use the mobile for later purposes. In such cases, Tickle My Phone checks the number with registered number if any mis match is found it wil send SMS to alternate numbers given. You can also enable Email alerts about Sim Change and play sounds whenever there is a Sim Change. Note: Please note free version will have limited functionality… However you can avail Introductory offer for full version now for just $2. Grab before it ends. 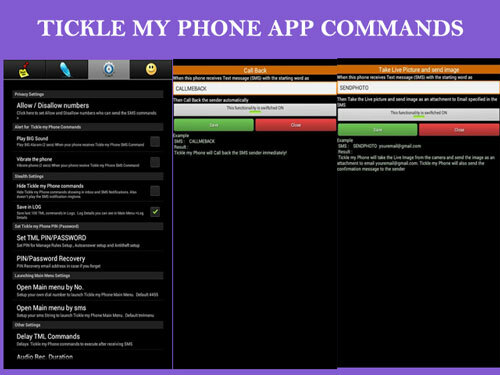 This is all about Tickle My phone App Review, Features, How to Download, Install and Use App. Do share your thoughts about this app by commenting below.